But I'm one that needs deadlines to get things done, and of course, I love the feeling when they're finished. 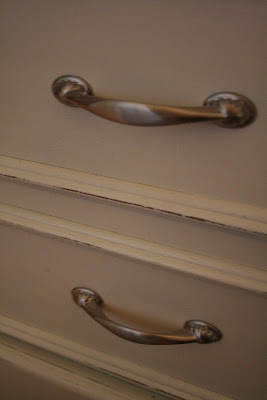 Okay, they're really not that exciting: I used the same color on both~I didn't want cream, didn't want white-white, so I tried out Kimm's favorite Rustoleum Heirloom White (Home Depot) and I love it! The knobs are from Hobby Lobby, they were $3.50 each (50% off last week!) I chose them because they were big and chunky and the backplate matched the existing hinges, so I didn't have to do anything to those. The builders put these cool little hinged cabinets here and in the bathrooms~they are for a little laundry type chute, but we just use this for a pantry since we don't have lots of storage space in the kitchen. Sanded all the pen marks and water damaged top, primed it, then spray painted it with the heirloom white, and added simple brushed nickel handles. I took the sander and lightly went over the edges for a little bit of a worn-in look. Phew! I feel like I just turned in a huge term paper. By the skin of my teeth...don't ask what the rest of the house looks like, but hey, I got some projects done, right? Thanks for the challenge, Melissa! Head on over to the Inspired Room to see everyone's after pics! Wow, you RAWKED your projects girl! They look wonderful! Bummer about the misadventure but you know I understand about those, lol. Great job, they look SO MUCH better! I bet you are so excited to have them done! Oh, both your projects turned out wonderful! And I love the hardware on both. I couldn't wait to come and see what you had done and Awesome they are! I love that chest and the hall door is sooooo awesome! Great Job! Wow, they turned out GREAT! I especially love the chest. It looks awesome!! Heavenly changes! So nice and clean compare to the before one. Great job..I love getting knobs at hobby lobby, too. I am taking part in this project procrastination too. Now if I can just get my post done and up I will be feeling very accomplished. Your projects turned out sooo good! Love it all! I love the trunk - it looks awesome! Just like a term paper...ha! I like all your projects...they look so fresh and updated. The trunk is fabulous. I can't get over how much you young'uns get done even with the little ones in tow. Marvelous! Looks great! I need to pull out a paint brush at my house. Those look awesome! I used Heirloom White on my chairs and I LOVE that color of white. I'll be using that for a lot of other painting projects around my home. 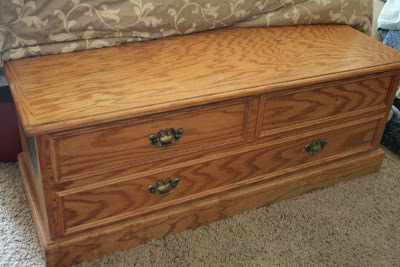 It's ironic you redid the cedar chest. I have one my husband gave me before we were married. It got mishandled by Army movers years and years ago and hasn't been the same since. Hubby worked on it some, but I'm still not satisfied with how it looks and was wondering about painting it. Guess what I'll be doing soon??? Thanks for the inspiration. Wow, that a huge transformation. And you nailed two project instead of one - I'm impressed. Girl,both projects are awesome. Just the change in hardware updated them SO much. Then add the fresh coat of paint and they look like a million bucks! great job! We have a tone of cabinets in our hallway that need this done to them. FANTASTIC! And, I didn't know that I could paint cedar? Hmmmm. I might have another project. 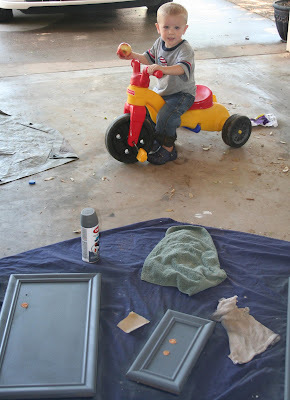 But, first need to finish the drop cloth curtains that I want to do for my deck! Way to go! You got yours finished! It is just amazing what a little paint can do! I know you're glad to have those projects over! Painting furniture is NOT something I'm good at, but you did a great job! Great job! Those cabinet doors look great. I bet you smile every time you walk by now. Sick kids and two projects completed! You rock! You made me feel like I was watching a suspense movie hanging sitting on the edge of my seat waiting to see if you finished or not. And Yay you did, barely. LOL! Okay now I can sit back and relax, whew. Seriously, the cupboard looks great. I love how it looks now and the new hardward too. Cedar chest is looking great also. Congrats on finishing!! Very nice! You finished two projects and had sick kids? Crazy! I'm really impressed. Both projects look so much better, btw! Wow! What a great job! The chest and closet look great! You have been busy girl! Love your new cabinets. They look amazing. The knobs are great too. Don't you just love Hobby Lobby's knob selection. I also love the chest. It looks great in its new coat of heirloom white. The project looks great. I love white wood. And I love the name "Project procrastination" - I've been meaning to repain the bedroom for quite some time, perhaps I will have to use that phrase now. Love both of your projects! I didn't know Hobby Lobby sold knobs. Now I'm really wishing there was one closer to my house. Yours look great! LOVE IT! Let me ask you one question though..did you put a sealer over the cabinet door? My huib and I are painting the kitchen cabs in that exact paint and well..I feel I need a sealer so they are wipeable being they are in the kitchn. I love the color! Fantastic. Just fantastic. No other words are necessary. Woo hoo!!! At least you got yours done. Paint is magic!! Great job, they both look fabulous. LOVE them both, but especially that hallway cabinet! What a transformation. And of couse the heirloom white looks perfect. Kimm turned me on to it too! I'm on my 4th can already. I love them both! You really took two dated pieces and made them beautiful and up-to-date! Great job! Thanks for sharing! Great job!! I love your projects! 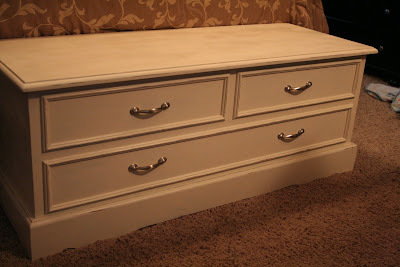 Melissa, you did a great job on those, I just love creamy white paint & it makes a huge difference in both your projects. Your re-dos are just great! Your choice of creamy white is just perfect. Thank for sharing with all of us. Your posts are SUPER! Wow, they're AWESOME! So glad you like Heirloom White! So... do you think I could get Rustoleum to rename it "Kimm's Heirloom White?" they're both so great! esp love the cedar chest... it's perfect! I love that little closet/pantry thing. So fun! And the chest looks AMAZING now. Fabulous job! I have a question for ya...when redoing items like these that have knobs or pulls, do you often find exact matches as far as the holes go? So often I procrasitnate on a project because I would have to fill the old hole and drill new ones. Are you just luckier than me? Or is filling a redrilling just easier than I think??? Fantastic transformations! Big improvement. 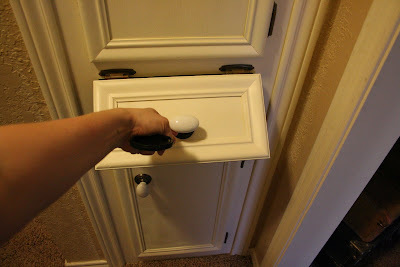 How did you do the trim of the pantry door (the part you couldn't take off and take into the garage)? Love the new looks! That little hinged cabinet looks so cute, and the new knobs really do wonders. They both look great! I love your knobs and wish I had a Hobby Lobby nearby! wow! The door looks great!